Peter Ionovich Baranov (6.IX.1892 - 5.IX.1933) - Soviet military and political activist, one of the organizers of the Air Force Fleet and the aircraft industry of the USSR. Member of the Communist Party since 1912, Baranov's name is associated with the development of soviet aviation. The son of a water carrier became one of the most effective statesmen of the period. Six and a half years, from December 1924 to June 1931, he led the air force red army, and then for two years, until his tragic death in 1933, led the aviation industry in the country. It was then that the young soviet state built on the ruins of a great empire, rapidly, and for many in the world and quite suddenly began to transform into a superpower. History is made by real people, and their personal qualities, sometimes play a crucial role in success or failure. Unlike such military leaders as Alksnis and Tukhachevsky, he did not live until to repression in 1937 and had not gotten into the martyrology of the regime, and therefore did not attract the keen attention of historians and publicists. Largely this is due to his personal modesty. About his personal life he left little information. Baranov was born on September 22 (September 10, old style), according to other sources – September 18 (September 6, old style) 1892 in the village of steep top of the zaraysky district of the ryazan province. Peter was the fifth of eleven children. After the hungry year, the family left their homeland. His father worked as krusnica in the port, then became a water carrier in the new village, a suburb of st. Petersburg. The boy was 13 years old when his father died. To feed and help the family, Peter was apprenticed to the trade office "Prodamet". In 1912 he became a member of RSDLP(b). At age 18 years, he received a bullet wound, participating in demonstrations of workers of the Vyborg district. In 1913 he was exiled from St. Petersburg for his revolutionary activities. In 1915, drafted into the army, but in 1916 he was sentenced to 8 years in prison for his revolutionary activities. A curious document is preserved – a prison notebook, which Baranov was given "For the problems and exercises in mathematics, physics, chemistry and literature." He was released by the February Revolution. In September 1917, he was chairman of the front-line department of Rumcherod and a member of the Revolutionary Committee of the Romanian Front, and since October he has been the Revolutionary Committee and Army Committee of the RSDLP (b) of the 8th Army. In the Red Army - since 1918. He commanded the 4th Donetsk Army, in 1919 - a member of the RVS of the Southern Group of the Eastern Front, in January 1920 - a member of the Turkestan CEC and a member of the RVS of the 1st Army, in September - a member of the RVS of the 14th Army. Delegate of the Tenth Congress of the RCP (B.) And participant in the suppression of the Kronstadt insurgency. In 1921-1922, Baranov was a member of the RVS of the Turkestan Front, commanded the troops of the Fergana region, a member of the Central Asian Bureau of the Central Committee of the RCP (B.). 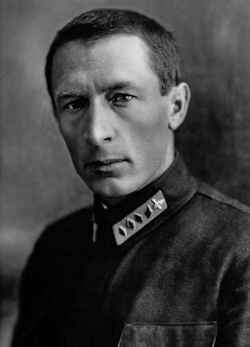 In 1923 - the head and commissioner of the Red Army of the Red Army. In the years 1924-1931 he was head of the Red Army Air Force and from 1925 - a member of the Revolutionary Military Council of the USSR. From the 13th Congress of the RCP (B.) (1924), a member of the Central Control Commission; XV (1927) and XVI (1930) congresses elected a candidate member of the Central Committee of the CPSU (b). Ch CPSU since 1912. In the Sov. Army since 1918. For an active revolution. the activity was repressed, in 1913 expelled from St. Petersburg and deprived of the right of residence in major cities of Russia. In 1915 he was mobilized into the army, in 1916 for the revolution. work among the soldiers convicted of military field. court for 8 years hard labor. Released Feb. revolution. In March 1917 he was elected before, the regimental one, in September. - before, front-line department of Rumcherod (Center, execute, the Council of the Councils of the Room of the Front, the Black Sea, the fleet and the Odessa Military District), member Revcom Rum. front. In 1918, he commanded the 4th Donetsk Army, which reflected the advance of the Austro-Germ. troops and the White Cossacks in the Donbass. In 1919–20 was consistently tsp. RVS 8th Army, South groups of East front, Turkestan, front, 1st and 14th armies. In 1921, he was the head of the political department of the troops of Ukraine and Crimea. As a delegate to the 10th Party Congress, he participated in the suppression of the Kronstadt mutiny; For the courage he was awarded the Order of the Red Banner. The death of Baranov in 1933, as well as the elimination in the future of such independent figures as Ya.I. Alksnis and M.N. Tukhachevsky, did not pass aviation without a trace. They were often replaced by people whose competence could not be compared with their predecessors. For example, in September 1933, an aviation exhibition was held at the Central Aerodrome in Moscow. The newly minted head of the Soviet aircraft industry, being at the event, came to life at the sight of an elegant AIR-6 airship designed by A.S. Yakovleva: “You can immediately see foreign work. This is culture! Soon we will learn to build like this.” When he was told that this plane was domestic, he yawned and went on. Or another case. A couple of months after the entry of the new head of the aviation industry, A.S. Yakovlev, who survived from the factory number 39. Korolev told the designer, who was to become the creator of the best Soviet fighter of the Great Patriotic War: “Evicted from the factory? Correctly do. I have instructed to place your design office in the bed shop.” And he added that the task of producing beds from the workshop is not removed.